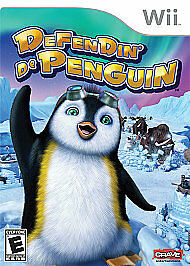 Defendin' De Penguin (Nintendo Wii, 2008) COMPLETE! $1 Combined Shipping! Safari Adventures: Africa (Nintendo Wii, 2009) Wii NEW! Create an icy fortress to repel the comical advances of arctic wildlife in Defendin' de Penguin, a real-time strategy game aimed at children ages 12 and under. Help a penguin named Little Blue protect his town's fish supply from an assortment of hungry adversaries. Build up to eight tower types to ward off such creatures as seals, snapping turtles, wooly mammoths, and even snowmen. Igloo-shaped turrets equipped with snowball, icicle, and ice cube cannons are available to augment your fortress, each offering upgrades to improve attack range and strength. Little Blue is also free to waddle or wade across the battlefield, scooping up an assortment of helpful items strewn about the map. Stationing your flippered friend in a tower can also temporarily boost its offense. Successfully prevent waves of enemies from infiltrating your base to save your village. If you have a young (4-6 year old) gamer, this is probably a good starter game. But it is not for those 7 years and up with any experience playing WII. The story is simple and repetitive so a young child will be challenged to do better with each level. Good game for younger children. No bloody violence. Animals just disappear. Cute characters. Challenging for a good range of children. All three of my grandchildren liked it and played it. Ages 5-10. Da Penguins are so much fun!!! Fun for my whole family, we couldn't wait for christmas!!!! We invited the whole dance studio to come play for the weekend. So fun to see little ones play with the older kids and my oldest daughter and the other dance teachers playing!!!! We are going to try to get a few more for christmas gifts!!! Thank You so much!!!! And Merry Christmas!!!! The kids are learning how to play the game. They are doing pretty well. There are lots of layers of strategy for them to learn as they grow.